How do you top the thrill of three Super Bowl rings? You don't. 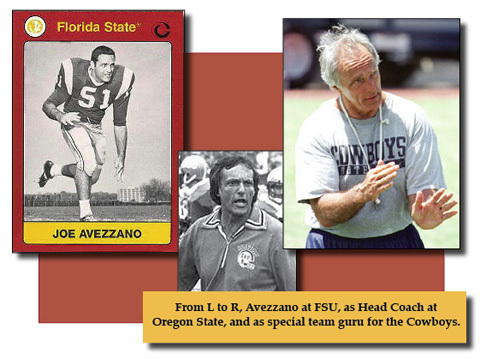 But Joe Avezzano -- who anchored the OL at FSU from 1963 through '65 -- is equally proud of the less glitzy awards from his peers. He's the only three-time winner of the NFL Special Teams Coach of the Year award voted by NFL special teams coaches. His Dallas Cowboy units consistently finished near the top in all four major kicking game stats, while blocking 23 kicks and returning 18 punts and kickoffs for TDs. Joe's long relationship with the Cowboys covered 13 years and three Super Bowls ('92, '93 and '95). 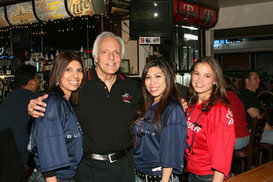 In 2002, he served as Head Coach of the Arena League's Dallas Desperados' as well as Cowboys' special teams guru. Among Joe's coaching stops at the college level were FSU in 1968, Iowa State from 1969 thru '72, and head coach at Oregon State from 1980-84. After finishing his career with the Raiders, Joe hung up his whistle in 2006. But he never slowed down. He and his son Tony own and operate two sports bars in the Dallas area -- gruelling work as you can tell by the photo above -- and he talks Cowboys on the radio during the season. Joe recently took time out to chat with us about his playing and coaching career. What's your best memory of FSU's breakout season of '64? "Sure, I enjoy the memory of the wonderful '64 season. But it's the people: me and Freddy and Steve and George D'Allessandro and (Phil) Spooner and (Terry) Gavin and (Dale) MacKenzie and (Tom) West and (Jack) Edwards -- we all came in as Coach Peterson's first recruiting class. And we just had a bond as a freshmen team. We were cocky. We believed in each other, we liked each other. And we just knew we could be good. And the journey with those guys, and Coach Peterson, the coaches that we really enjoyed... Winning that Gator Bowl in '64 was the destination, but if you don't enjoy the journey then you really can't enjoy the rest of it." How was it rooming with Steve Tensi your freshmen year? "I moved into my room, waiting to see who my roommate would be. And it's this gangly 6 foot 5" guy from Cincinnati Elder High School, which I'd never heard of. He was an absolute Elvis Presley freak, and had every record, knew every word of Elvis's songs. Could imitate him. And I had to deal with that until finally he got married. But I loved it."